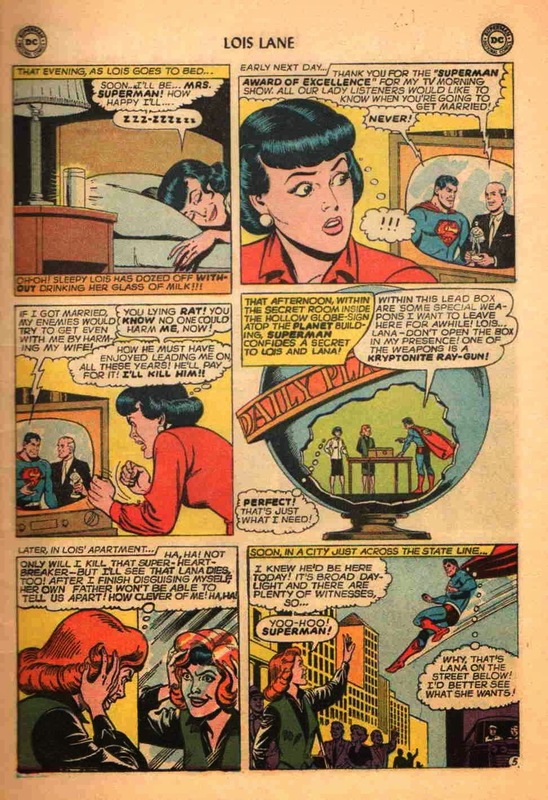 Next morning, the TV talks to Lois, screaming metaphorically that Supes evidently doesn't care about all the effort she went to to make herself his perfect pound-proof pet. And in a significant scene, later that day, he tells her and Lana about a deadly Green-K gun in a secret stash. Anybody guess where this weird story is going next? Remember that splash page. Sure enough, a red wig will make Lois an identical match for Lana. That's a great plan! It's not as if Superman might use any of his OTHER TEN THOUSAND SUPER-SENSES to notice that you are really Lois, Lois! And, "just across the state line"? There's your plot hint, Gentle Reader! Across the state line ... into The Twilight Zone! Feel free to zoom in on these drawings of Lois-as-Lana. It sure looks like, TO MY EYES, that these are not drawings of the established Lois face, and then given red hair. 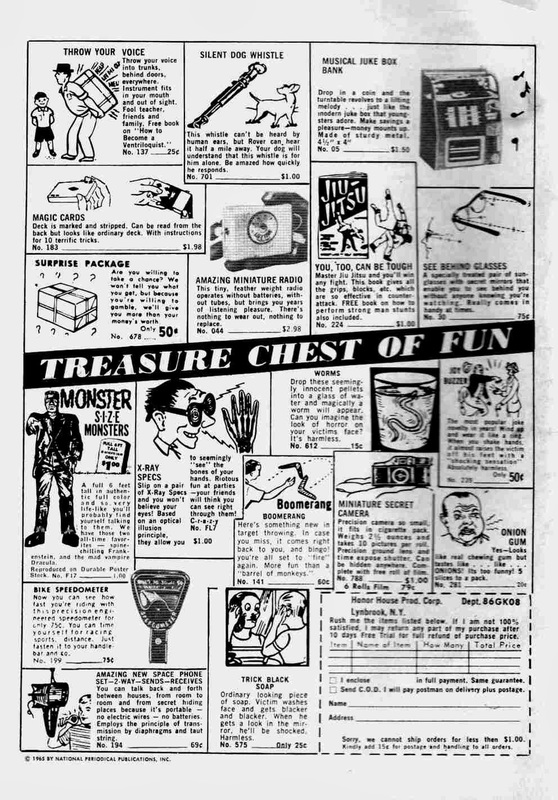 No, those two top panels show Kurt Schaffenberger's typical Lana. Subtle that I noticed, no? 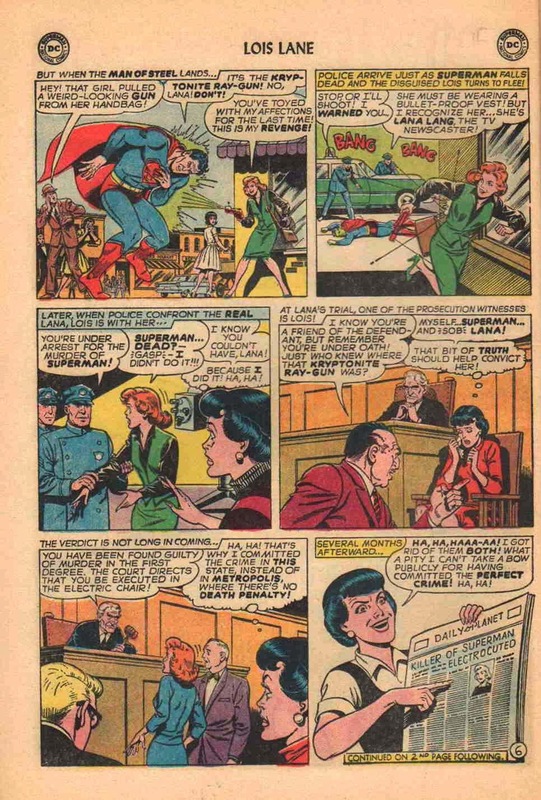 Evidently Lois' ploy worked, because in four panels we see Lana convicted -- OF SUPERMAN'S MURDER -- and given a magic chair ride. Wow, don't Lois look positively DEMONIC in that last panel? What's next in this twisted tale of jealousy and (so far) double murder? The aliens' helpful use of a "Bazor Tube" (huh?) has convinced Lois that she is indeed unbreakable. So she decides to get Superman's attention by blowing up the top of a mountain to prove her resilience. For that matter ... did she file an Environmental Impact statement before this act of demilotion? Does she have the proper permits? 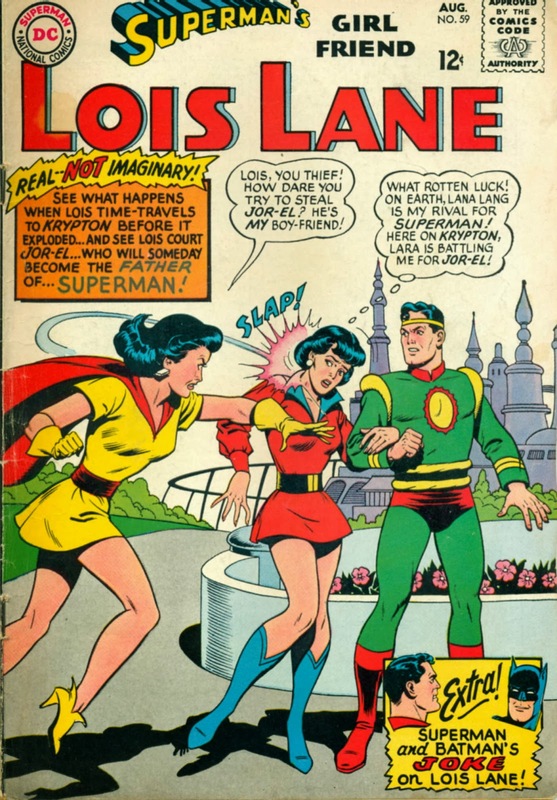 In 1963's Lois Lane #38 there was a story about Lois getting a Signal Watch from Superman, but it was only a temporary situation for that story. At the end there is talk that Lois MIGHT get one. With schemes like this one, she sure is proving how mature and responsible and trust-deserving she is, don't you think? Nothing forward about this gal, eh? She staged this thing just to prove her unflappability to the Super-object of her affections. Now she's safe to marry! 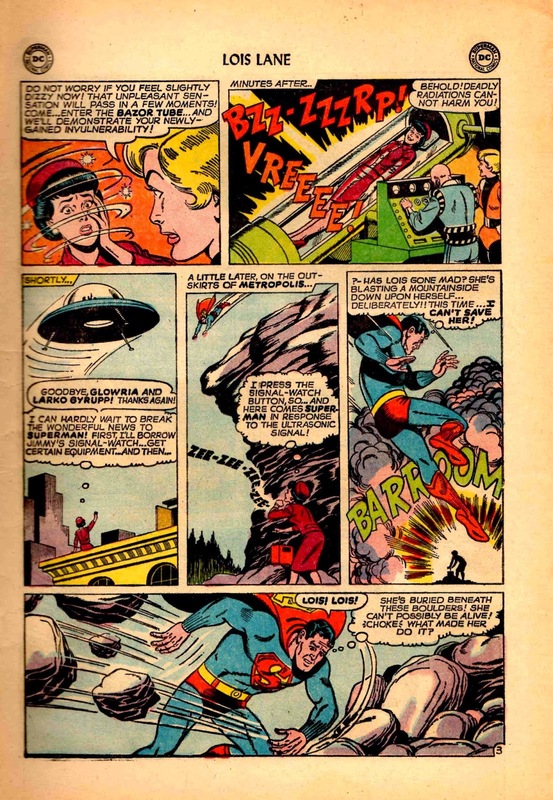 Of course, a semi-realistic thought balloon for the top right panel might have featured Superman thinking, "Looks: CHECK! Invulnerability: CHECK! Common Sense: ehhh.."
So of course Lois's second action is to have one of those "I know something I can't say" tete-a-tetes with Lana, her romantic rival. After this she gurgles her daily prophylactic milk dose. 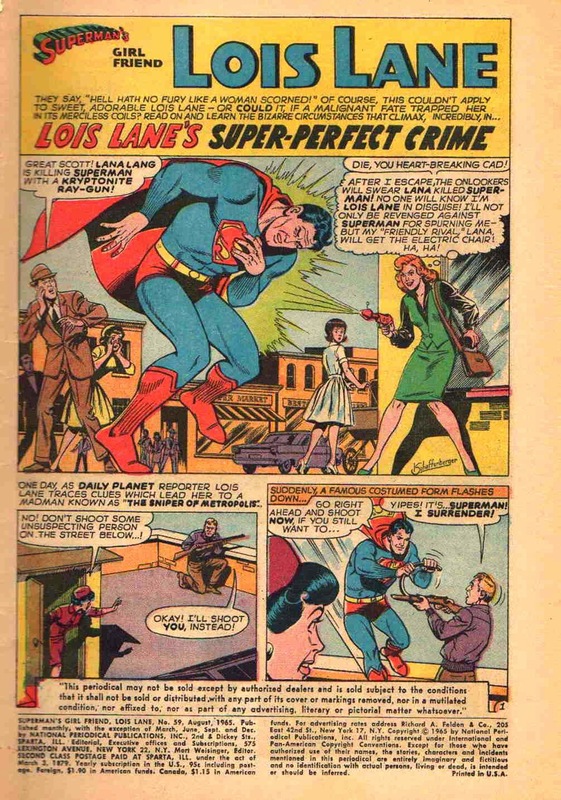 Yes, it's time to start another Silver Age journey, this time through the pages of issue #59 of Superman's Girl Friend, Lois Lane. Cover-dated August 1965, it came out when I was about to turn nine. We open with a great catfight scene, as portrayed by Lois' glamor artist, Kurt Schaffenberger. Good grief, Lois thinks. First I ruin Lana Lang's life, now I'm about to screw over the life of Superman's would-be mama, Lara, too! Actually, she doesn't see it that way, more's the pity. And of course the males in these stories are merely arm candy, waiting to see to which victorious dame they'll be assigned. We open our story with a dream of every woman in love -- to see her romantic rival sent to the electric chair! BWAH-HA-HA! But I bet any real-life superhero would LOVE to tell off his admirers the way Supes does in the first panel of this page! If she would only keep her head down, his life would be a lot easier! But, wait! Some conveniently English-speaking aliens doth arrive... Hmmm.... what strange names ... Gloria from Gossamer! 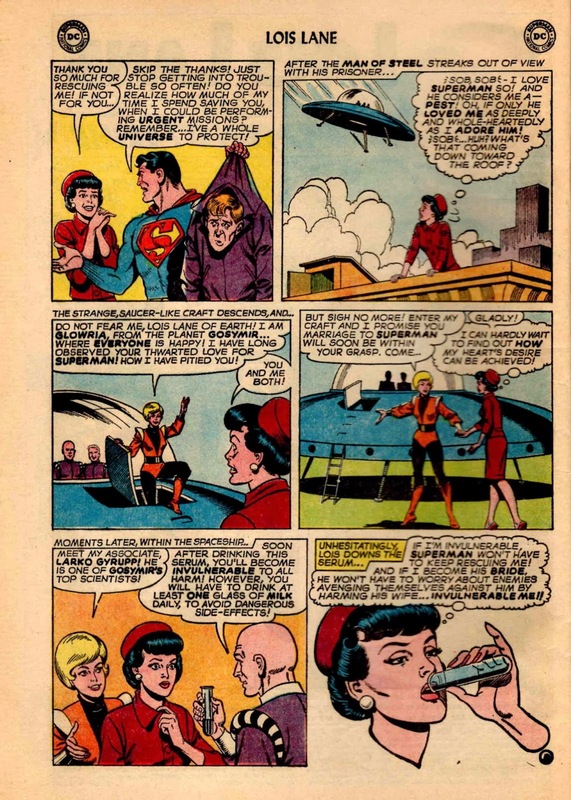 Of course, Lois being the self-centered gal we know and love, she has no problems in believing that a bunch of spacefarers would have studied her life in detail, and have decided that it is in their power to match her up with the single mightiest being in the universe! 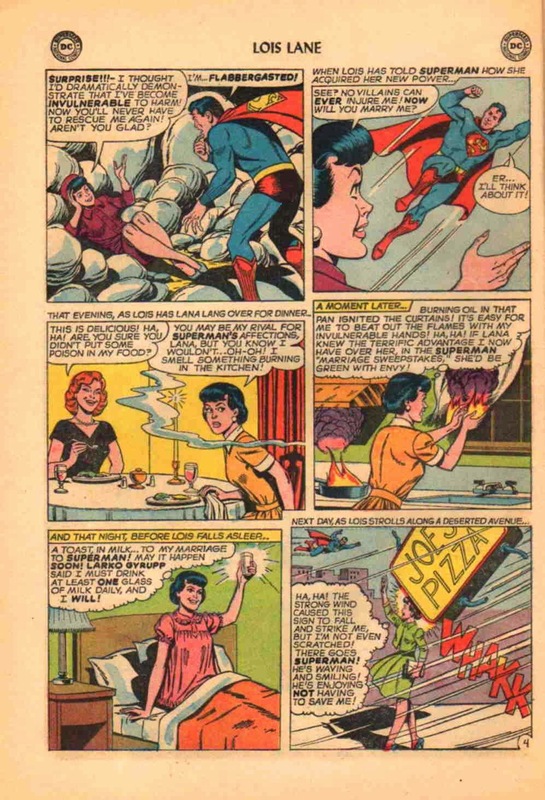 Next we see Lois quickly guzzling some invulnerability juice. Good thing the only precaution she has is, she also has to drink a daily glass of moo juice to avoid "dangerous side-effects." Of course, HOW DANGEROUS are these side-effects? Will they give her Kryptonite breath? Make her hair fall out? Make her female secretions super-acid? Surely nothing bad can come of this, right?